Lovely B&B. Will use again. We enjoyed staying here for two nights during our visit to Killarney, Ireland. The room was very cozy and very comfortable. The full Irish breakfast was great and the dining room was just large enough to exchange stories on what each quest had done the previous day. Would stay there again even though it is a little older than some B&B's offered for the area. We got a peaceful nights sleep which we needed as my husband was stressed out about driving on the left side of the road, sitting on the opposite side of the car and shifting gears with his left hand. The streets are sooooo narrow there. Barbara even filled our drinking jugs with ice and water for our days excursions. The location is right on the start of the Ring of Kerry which was a beautiful drive. The owners were very accommodating. A fantastic location, close to the hotel where we were attending a wedding. We were met by warm and welcoming hosts who made us feel at home over the weekend. Lovely friendly people who didn't mind too much when Mayo beat Kerry in the semi final! Paudie and Julie, we'll be back! I really enjoyed my stay at Woodlands. Spacious bedroom for single occupation and very comfy bed. Well presented accommodation and a friendly vibe with Patrick & Julia. Good choice of breakfasts and easy parking. We spent two nights in the Woodlands B&B while we did the Ring of Kerry. Patrick was so helpful and gave us several suggestions of things to see locally and on The Ring. The house is beautiful and the breakfast was delicious...and VERY plentiful. Loved it! We had a delightful stay. The B&B is an easy walk to the town. Our host arranged a bus tour of the Ring of Kerry for us; it was very nice. Das Haus ist sehr liebevoll eingerichtet, sehr nette und aufmerksame Gastgeber. Sie geben tolle Tips zum Erkunden der Gegend. Die Lage ist optimal für Ausflüge zum Ring of Kerry. Das Frühstück konnte man aus mehreren Optionen auswählen, es war sehr liebevoll angerichtet, immer frisches Obst etc., äußerst üppig und sehr gut. Patrick and Julia are very warm hosts who made sure every need was taken care of without making a nuisance of themselves. Food was delicious and plentiful. The place is really more of a motor inn with breakfast than a B&B, as I did not see any common room where visitors could gather, aside from the dining room, and the walls are a bit thin. Still, for the price, I'm very pleased. The hosts, the accommodation, and the breakfasts were wonderful! Would have preferred tea and coffee making facilities in the room rather than having to run past other rooms in your Jim jams to a dedicated station to make it. Would return! Great hospitality, helpfulness - we enjoyed the stay and the delicious breakfast. If you want a homely comfortable place to stay this is it.Great friendly people who can't do enough for you.Comfy beds Wifi and a wonderful selection for breakfast . A Good stroll into the town or across road to Killarney National Park and the lakes. Lovely place to stay, neat and clean, comfy beds, tasty breakfast with many options, running by really nice people plenty of suggestions. The area is an amazing place surrounded by stunning landscapes. I would certainly recommend woodlands if you are visiting beautiful Kerry county. The location is perfect with easy accessibility to the town and surrounding areas.. the accommodations were comfortable and the breakfasts were great! Had a wonderful stay with the Woodlands. The communication was great from the time of booking. The room was very large and clean. The breakfast was delicious. And the price was perfect! We really enjoyed our stay at woodlands. Nice varieties of breakfast and always a nice and friendly welcome. We can definetly recommend this B&B and its hosts. Really good place to stay, excellent breakfast and fantastic nice people. A truly excellent B&B in all respects. The hosts, Julia and Patrick, provided the warmest of genuine Irish welcomes and generous hospitality always. The breakfast selection was wide, more than plentiful and always beautifully presented. The room was clean on arrival and impeccably maintained for the duration of our 8 night stay with big, fluffy fresh towels everyday. Julia and Patrick provided excellent local travel tips which definitely added to our enjoyment of spectacular Killarney and its scenic surrounds. Woodlands must be the gem of B&Bs in Killarney. We loved it all and hope to return again to Woodlands in the future. Wir hatten eine schöne Zeit im Woodland House in Killarney. We enjoyed good accommodation, great breakfasts and excellent hospitality with Patrick and Julia for a second time. A very nice B&B, with very friendly welcome and helpful recommendations. Clean, spacious rooms, central Location and very good breakfast of great variety. Wanting to go back!!! We had a wonderful night at Woodlands B&B. Patrick is a wonderful host. The breakfast was wonderful. After several days of really big Irish breakfasts, Woodlands offered a fruit and yogurt option as well which was really nice. It is in a very nice location right across from the park. We took a beautiful walk thru the park in the late afternoon, thanks to Patrick's advice. The rooms are extremely comfortable and spacious. I would recommend this B&B to anyone. The B and B was very clean and efficiently run. We had a nice stay there. A big room and a nice breakfast. A lovely place to stay with one of the friendliest and helpful hosts of my entire stay. The room was spacious and comfortable, the breakfast well presented and the location ideal, with only a short walk through the Park to get to town. I hope to come back to the area and when I do I'll want to stay here. We had an excellent time. Woodland was clean and the breakfast was great. We could not ask for better. Wir hatten einen tollen Aufenthalt im Woodlands B&B. Sehr gutes Preis- Leistungsverhältnis. Sehr nette Leute dort. Wir haben viele gute Tipps und Hinweise für die Reise bekommen. Ich kann das B&B weiterempfehlen und würde jederzeit hierher zurückkehren. Danke für die tolle Zeit! Excellent service, great breakfast choices, friendly people who have been a great help in the preparation of an group journey to Killarney next year. Very clean room and bathroom. Walking distance to city-center. Very nice, clean B&B. There were 8 in our party for 4 rooms. We were happy to be accommodated. The host was very helpful, getting us taxis, etc. for some of our party was not as agile to do the walk to town. It is definitely walkable if you are able. The breakfast was very good also. Would recommend. Stayed for two night, travelling on motorbikes. Plenty of good parking. Lovely room at the back, but with window open could still hear traffic noise. A short walk to the town, via a parkland path with stunning views. Helpful hosts and good breakfast. A very pleasant stay - hosts Patrick & Julie were excellent with all our needs met most graciously. Woodlands is an excellent B&B, our hosts were very helpful and friendly. The breakfast was excellent in quantity and quality. Rooms are very nice, roomy and clean. The owners are always willing to help you and give all the information you need. It's about 2km away from Killarney's center but you can go on foot, bike or car. Woodlands B&B was very comfortable and roomy. Tea and coffee facilities weren't in the room but very close and accessible in the hallway. Breakfasts were a treat - well cooked and good choices available. Patrick was a delightful host offering good suggestions of where to eat, laundry and hair services, family contact in Castlemaine, etc. Went the extra mile to facilitate our needs. We, and our friends, enjoyed our stay of 4 nights immensely. Excellent B&B. Our host was gracious, informative, very helpful, and very friendly. The rooms were very nice and clean. The B&B was on a main road, which was convenient and only a short walk to downtown. Despite fronting onto this road, the rooms were very quiet they are in the back of the building. We were able to walk downtown each evening for dinner and pubs through a lovely park that includes magnificent views of the lake. Very nice stay at this house, good advices vom Patrick to see the good looks around Killarney. Very warm and welcoming owners, delicious breakfasts. The rooms were large and clean. Wonderful stay and hope to return. Patrick and Julia were the perfect hosts to our golf holiday. Our rooms were lovely and the food and directions each day were great. Would stay here again. first b&b experience and we were not disappointed! the location is good- close but not too close to downtown. breakfast was delish and kept us full all day. the hospitality was second to none- the room and bathroom were cleaned every day, patrick had great ideas for activities for the undecided and overall was a great experience. Great Stay, perfekt rooms, Patrik the Owner make the stay for us awsome. He is very helpfull and gave us very good suggestions. The breakfast was great and fondly served. The room was very big and with a good bathroom. From this location you can reach everything in 30-40 min. arround. We got a perfect suggestion for a great walk to the Killarney Castle from Woodlands. Book it and you will love it !!! Great B&B! The room was perfect, the breakfast delicious and plentiful, the hosts really friendly, and an ideal location to visit the Ring of Kerry and Dingle Peninsula. Highly advisable!! We recently stayed here and can highly recommend the woodlands b&b. Patrick is welcoming, warm& very helpful. He advised us on our trips as we were a little uncertain and gave us all the info we needed. The rooms are immaculate and our beds were made the day after with fresh towels in the bathroom. Soap is provided but no shampoo here but i honestly cannot fault it. The breakfasts are generous and delicious and the price very good. We had a car so went into town by car both evenings and both times managed to find parking.it is a 5 min drive if that into town and a nice walk in if you cut through the park but we didn't do that. We left the Woodlands b&b with a warm friendly feeling and we will definataly return if we visit the area again. Thank you Patrick and your wife, who we didn't manage to meet. The room was HUGE and so was the breakfast. I just loved this place because everything was as it should be. Warm and inviting, close to town and the owners friendly and very informative. Could have spent more time there but, unfortunately, had to keep moving on. We enjoyed our stay a lot. The breakfast was simply amazing! Good location! 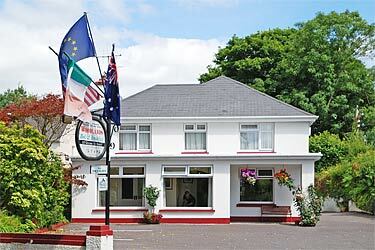 Woodland's B&B is conviently located for a short walk to Killarney. The Owner is very friendly and helpful, the room was very clean and comfy, the breakfast was excellent and finely presented. We enjoyed our staying here. Patrick and Julia who run the B&B were extremely friendly and welcoming They gave us a lot of great tips about the area, even better directions, and the best breakfasts that we had out of the 4 B&Bs I stayed in while in Ireland Definitely very highly recommended, wouldn't stay anywhere else! Spent two nights at this lovely B and B which is just across the street from the beautiful Killarney National Park Our hosts were very friendly, room was a good size and breakfast was lovely Killarney was our favorite city, also!